Click here to read the story below on the biggest winners and loser from baseball trades before the July 31 deadline. As noted, these ratings were compiled as we played Statis-Pro baseball games and changed the player cards we made from team-to-team to see how line-up and pitching rotations were likely to impact the standings and playoff picture (updates here on our standings). We created a number of rookie cards earlier in the year you can find here, and you can continue to make your own using this google sheet. The important new pickups referenced below as well as several top rookies not included in the "find here" link are pasted below in alphabetical order. We have not yet added their fielding stats - which take a little longer - so generally treat everyone as an E4, CD2, T3 or TC. The first grid below is batters. Arizona Escobar 3b1-MN .758 card (.858) 3 Minnesota Twins traded SS Eduardo Escobar to Arizona Diamondbacks for RF Ernie De La Trinidad, RF Gabriel Maciel and RHP Jhoan Duran. Arizona Diekman R6-PROJ 3.77 2 Texas Rangers traded LHP Jake Diekman to Arizona Diamondbacks for RHP Wei-Chieh Huang and Player To Be Named Later. Arizona Andriese R7-TB 4.50 (4.38) 1 Tampa Bay Rays traded RHP Matt Andriese to Arizona Diamondbacks for C Michael Perez and RHP Brian Shaffer. Arizona Perez c2-NEW 0 Tampa Bay Rays traded RHP Matt Andriese to Arizona Diamondbacks for C Michael Perez and RHP Brian Shaffer. Atlanta Brach R4-Balt 3.18 (4.73) 3 Baltimore Orioles traded RHP Brad Brach to Atlanta Braves for Future Considerations. Atlanta Venters R6-PROJ 3.56 2 Tampa Bay Rays traded LHP Jonny Venters to Atlanta Braves for Future Considerations. Atlanta Duval LF2-Cin .782 (.685) 1 Cincinnati Reds traded LF Adam Duvall to Atlanta Braves for RHP Lucas Sims, RHP Matt Wisler and Preston Tucker. Atlanta 0 Baltimore Orioles traded RHP Kevin Gausman and RHP Darren O'Day to Atlanta Braves for RHP Evan Phillips, 3B Jean Carlos Encarnacion, C Brett Cumberland, LHP Bruce Zimmermann and Future Considerations. Atlanta Tucker LF4-PROJ .735 -2 Cincinnati Reds traded LF Adam Duvall to Atlanta Braves for RHP Lucas Sims, RHP Matt Wisler and Preston Tucker. Baltimore Villar 2b2-Mil .665 (.693) 1 Baltimore Orioles traded 2B Jonathan Schoop to Milwaukee Brewers for 2B Jonathan Villar, RHP Luis Ortizand SS Jean Carmona. Baltimore Carrol R7-NEW minors 0 Baltimore Orioles traded LHP Zach Britton to New York Yankees for RHP Cody Carroll, RHP Dillon Tate and LHP Josh Rogers. Baltimore Valera 2b3- PROJ .506 0 Baltimore Orioles traded SS Manny Machado to Los Angeles Dodgers for 2B Breyvic Valera, RF Yusniel Diaz, RHP Zach Pop, RHP Dean Kremer and 3B Rylan Bannon. Baltimore Britton r3-Bal 3.89 (3.57) -2 Baltimore Orioles traded LHP Zach Britton to New York Yankees for RHP Cody Carroll, RHP Dillon Tate and LHP Josh Rogers. Baltimore Schoop 2b2-.841 (.720) -3 Baltimore Orioles traded 2B Jonathan Schoop to Milwaukee Brewers for 2B Jonathan Villar, RHP Luis Ortizand SS Jean Carmona. Baltimore Brach R4-Balt 3.18 (4.73) -3 Baltimore Orioles traded RHP Brad Brach to Atlanta Braves for Future Considerations. Baltimore Machado 3b1-.782 Glove (.953) -4 Baltimore Orioles traded SS Manny Machado to Los Angeles Dodgers for 2B Breyvic Valera, RF Yusniel Diaz, RHP Zach Pop, RHP Dean Kremer and 3B Rylan Bannon. Boston Eovaldi s3-PROJ 3.86 3 Tampa Bay Rays traded RHP Nathan Eovaldi to Boston Red Sox for LHP Jalen Beeks. Boston Kinsler 2b1-Bost .725 (708) 2 Los Angeles Angels traded 2B Ian Kinsler and cash to Boston Red Sox for RHP Ty Buttrey and LHP Williams Jerez. Boston Beeks r9-PROJ 6.23 0 Tampa Bay Rays traded RHP Nathan Eovaldi to Boston Red Sox for LHP Jalen Beeks. Chicago Cubs Kintzler r4-Combo 3.03 (3.59) 3 Washington Nationals traded RHP Brandon Kintzler to Chicago Cubs for RHP Jhon Romero. Chicago Cubs Hamel s3-Tex 4.20 (4.72) 2 Texas Rangers traded LHP Cole Hamels and cash to Chicago Cubs for Eddie Butler, RHP Rollie Lacy and Player To Be Named Later. Chicago Cubs Chavez r8-LAA 5.35 (3.03) 1 Texas Rangers traded RHP Jesse Chavez to Chicago Cubs for LHP Tyler Thomas. Chicago Cubs Butler r7-ChC 3.95 (3.79) -2 Texas Rangers traded LHP Cole Hamels and cash to Chicago Cubs for Eddie Butler, RHP Rollie Lacy and Player To Be Named Later. Chicago White Sox Soria r5-KC 3.70 (2.43) -3 Chicago White Sox traded RHP Joakim Soria and cash to Milwaukee Brewers for LHP Kodi Medeiros and RHP Wilber Perez. Cincinnati Tucker LF4-PROJ .735 2 Cincinnati Reds traded LF Adam Duvall to Atlanta Braves for RHP Lucas Sims, RHP Matt Wisler and Preston Tucker. Cincinnati Duval LF2-.782 (.685) -1 Cincinnati Reds traded LF Adam Duvall to Atlanta Braves for RHP Lucas Sims, RHP Matt Wisler and Preston Tucker. Cincinnati Floro r8-PROJ 3.04 -3 Cincinnati Reds traded RHP Dylan Floro, RHP Zach Neal and Future Considerations to Los Angeles Dodgers for RHP James Marinan and RHP Aneurys Zabala. Cleveland Hand r2 - SD 2.16 (2.90) 5 San Diego Padres traded LHP Brad Hand and RHP Adam Cimber to Cleveland Indians for C Francisco Mejia. Cleveland Cimber PROJ 3.33 3 San Diego Padres traded LHP Brad Hand and RHP Adam Cimber to Cleveland Indians for C Francisco Mejia. Colorado Oh r5-StL 4.10 (2.52) 2 Toronto Blue Jays traded RHP Seunghwan Oh to Colorado Rockies for 1B Chad Spanberger and 2B Forrest Wall. Houston Osuna rSus-Tor 3.38 (2.93) 4 Toronto Blue Jays traded RHP Roberto Osuna to Houston Astros for RHP David Paulino, RHP Hector Perezand RHP Ken Giles. Houston Pressley r8-Min 2.93 (6.30) 3 Minnesota Twins traded RHP Ryan Pressly to Houston Astros for CF Gilberto Celestino and RHP Jorge Alcala. Houston Maldonado c2-LAA .645 (.608) 0 Los Angeles Angels traded C Martin Maldonado to Houston Astros for LHP Patrick Sandoval and Future Considerations. Houston Giles r?-2.30 (4.99) -5 Toronto Blue Jays traded RHP Roberto Osuna to Houston Astros for RHP David Paulino, RHP Hector Perezand RHP Ken Giles. Kansas City Goodwin dl-Wash .811 (.774) 4 Washington Nationals traded LF Brian Goodwin to Kansas City Royals for RHP Jacob Condra-Bogan. Kansas City Phillips cf2-Mil .799 37 Gms (.615) 3 Kansas City Royals traded 3B Mike Moustakas to Milwaukee Brewers for CF Brett Phillips and RHP Jorge Lopez. Kansas City Moustakas 3b1-.835 (.764) -5 Kansas City Royals traded 3B Mike Moustakas to Milwaukee Brewers for CF Brett Phillips and RHP Jorge Lopez. Los Angeles Angels Maldonado c2-LAA .645 (.608) 0 Los Angeles Angels traded C Martin Maldonado to Houston Astros for LHP Patrick Sandoval and Future Considerations. Los Angeles Angels Kinsler 2b1-Bost .725 (708) -2 Los Angeles Angels traded 2B Ian Kinsler and cash to Boston Red Sox for RHP Ty Buttrey and LHP Williams Jerez. Los Angeles Dodgers Machado 3b1-Balt .782 Glove (.953) 4 Baltimore Orioles traded SS Manny Machado to Los Angeles Dodgers for 2B Breyvic Valera, RF Yusniel Diaz, RHP Zach Pop, RHP Dean Kremer and 3B Rylan Bannon. Los Angeles Dodgers Floro r8-PROJ 3.04 3 Cincinnati Reds traded RHP Dylan Floro, RHP Zach Neal and Future Considerations to Los Angeles Dodgers for RHP James Marinan and RHP Aneurys Zabala. Los Angeles Dodgers Dozier 2b1-Min .856 (.708) 3 Minnesota Twins traded 2B Brian Dozier to Los Angeles Dodgers for 2B Logan Forsythe, OF Luke Raley and LHP Devin Smeltzer. Los Angeles Dodgers Valera 2b3- PROJ .506 0 Baltimore Orioles traded SS Manny Machado to Los Angeles Dodgers for 2B Breyvic Valera, RF Yusniel Diaz, RHP Zach Pop, RHP Dean Kremer and 3B Rylan Bannon. Los Angeles Dodgers Forsyth 2b?-.678 (.560) -1 Minnesota Twins traded 2B Brian Dozier to Los Angeles Dodgers for 2B Logan Forsythe, OF Luke Raley and LHP Devin Smeltzer. Miami Maybin of?-Combo ..683 35 SB (.681) -2 Miami Marlins traded LF Cameron Maybin to Seattle Mariners for SS Bryson Brigman and Future Considerations. Milwaukee Moustakas 3b1-KC .835 (.764) 5 Kansas City Royals traded 3B Mike Moustakas to Milwaukee Brewers for CF Brett Phillips and RHP Jorge Lopez. Milwaukee Schoop 2b2-Bal .841 (.720) 3 Baltimore Orioles traded 2B Jonathan Schoop to Milwaukee Brewers for 2B Jonathan Villar, RHP Luis Ortizand SS Jean Carmona. Milwaukee Soria r5-KC 3.70 (2.43) 3 Chicago White Sox traded RHP Joakim Soria and cash to Milwaukee Brewers for LHP Kodi Medeiros and RHP Wilber Perez. Milwaukee Villar 2b2-Mil .665 (.693) -1 Baltimore Orioles traded 2B Jonathan Schoop to Milwaukee Brewers for 2B Jonathan Villar, RHP Luis Ortizand SS Jean Carmona. Milwaukee Phillips cf2-.799 37 Gms (.615) -3 Kansas City Royals traded 3B Mike Moustakas to Milwaukee Brewers for CF Brett Phillips and RHP Jorge Lopez. Minnesota Austin 1b?-.PROJ .725 2 Minnesota Twins traded RHP Lance Lynn and cash to New York Yankees for 1B Tyler Austin and RHP Luis Rijo. Minnesota Forsyth 2b?-LAD .678 (.560) 1 Minnesota Twins traded 2B Brian Dozier to Los Angeles Dodgers for 2B Logan Forsythe, OF Luke Raley and LHP Devin Smeltzer. Minnesota Duke r8-PROJ 3.65 -2 Minnesota Twins traded LHP Zach Duke and cash to Seattle Mariners for RHP Chase De Jong and 1B Ryan Costello. Minnesota Dozier 2b1-Min .856 (.708) -3 Minnesota Twins traded 2B Brian Dozier to Los Angeles Dodgers for 2B Logan Forsythe, OF Luke Raley and LHP Devin Smeltzer. Minnesota Lynn s6-StL 3.43 (5.10) -3 Minnesota Twins traded RHP Lance Lynn and cash to New York Yankees for 1B Tyler Austin and RHP Luis Rijo. Minnesota Pressley r8-Min 2.93 (6.30) -3 Minnesota Twins traded RHP Ryan Pressly to Houston Astros for CF Gilberto Celestino and RHP Jorge Alcala. Minnesota Escobar 3b1-MN .758 card (.858) -3 Minnesota Twins traded SS Eduardo Escobar to Arizona Diamondbacks for RF Ernie De La Trinidad, RF Gabriel Maciel and RHP Jhoan Duran. New York Mets Familia r2-4.28 (2.51) -1 New York Mets traded RHP Jeurys Familia to Oakland Athletics for RHP Bobby Wahl, 3B Will Toffey and Future Considerations. New York Mets Cabrera ss1-.785 (.796) -3 New York Mets traded 2B Asdrubal Cabrera to Philadelphia Phillies for RHP Franklyn Kilome. New York Yankees Lynn s6-StL 3.43 (5.10) 3 Minnesota Twins traded RHP Lance Lynn and cash to New York Yankees for 1B Tyler Austin and RHP Luis Rijo. New York Yankees Britton r3-Bal 3.89 (3.57) 2 Baltimore Orioles traded LHP Zach Britton to New York Yankees for RHP Cody Carroll, RHP Dillon Tate and LHP Josh Rogers. New York Yankees Happ s5-Tor 3.53 (4.05) 2 Toronto Blue Jays traded J.A. Happ to New York Yankees for LF Billy McKinney and 3B Brandon Drury. New York Yankees Carrol R7-NEW minors 0 Baltimore Orioles traded LHP Zach Britton to New York Yankees for RHP Cody Carroll, RHP Dillon Tate and LHP Josh Rogers. New York Yankees Austin 1b?-.PROJ .725 -2 Minnesota Twins traded RHP Lance Lynn and cash to New York Yankees for 1B Tyler Austin and RHP Luis Rijo. New York Yankees Shreve r8 -3.77 (4.15) -2 New York Yankees traded LHP Chasen Shreve and RHP Giovanny Gallegos to St. Louis Cardinals for 1B Luke Voit and Future Considerations. New York Yankees Drury 3b2-Ariz .764 (.527) -2 Toronto Blue Jays traded J.A. Happ to New York Yankees for LF Billy McKinney and 3B Brandon Drury. New York Yankees Warren r9-NYY 2.35 (2.70) -4 New York Yankees traded RHP Adam Warren to Seattle Mariners for Future Considerations. Oakland Familia r2-NYM 4.28 (2.51) 1 New York Mets traded RHP Jeurys Familia to Oakland Athletics for RHP Bobby Wahl, 3B Will Toffey and Future Considerations. Philadelphia W Ramos cDL-TB .737 (.834) 4 Tampa Bay Rays traded C Wilson Ramos to Philadelphia Phillies for Player To Be Named Later. Philadelphia Cabrera ss1-NYM .785 (.796) 3 New York Mets traded 2B Asdrubal Cabrera to Philadelphia Phillies for RHP Franklyn Kilome. Philadelphia Loup r8-Tor 3.75 (4.54) 2 Toronto Blue Jays traded LHP Aaron Loup to Philadelphia Phillies for RHP Jacob Waguespack. Pittsburgh Archer s1-TB 4.07 (4.31) 3 Tampa Bay Rays traded RHP Chris Archer to Pittsburgh Pirates for RHP Tyler Glasnow, CF Austin Meadowsand Player To Be Named Later. Pittsburgh Kela r2-Tex 2.79 (3.44) 3 Texas Rangers traded RHP Keone Kela to Pittsburgh Pirates for Taylor Hearn and Player To Be Named Later. Pittsburgh Glasnow s1-Pit 7.69 (4.34) -2 Tampa Bay Rays traded RHP Chris Archer to Pittsburgh Pirates for RHP Tyler Glasnow, CF Austin Meadowsand Player To Be Named Later. San Diego Hand r2 - SD 2.16 (2.90) -5 San Diego Padres traded LHP Brad Hand and RHP Adam Cimber to Cleveland Indians for C Francisco Mejia. San Diego Cimber PROJ 3.33 -3 San Diego Padres traded LHP Brad Hand and RHP Adam Cimber to Cleveland Indians for C Francisco Mejia. Seattle Warren r9-NYY 2.35 (2.70) 4 New York Yankees traded RHP Adam Warren to Seattle Mariners for Future Considerations. Seattle Tuivailala r-StL 2.55 (3.69) 3 St. Louis Cardinals traded RHP Sam Tuivailala to Seattle Mariners for RHP Seth Elledge. Seattle Maybin of?-Combo ..683 35 SB (.681) 2 Miami Marlins traded LF Cameron Maybin to Seattle Mariners for SS Bryson Brigman and Future Considerations. Seattle Duke r8-PROJ 3.65 2 Minnesota Twins traded LHP Zach Duke and cash to Seattle Mariners for RHP Chase De Jong and 1B Ryan Costello. St. Louis Shreve r8 -NYY 3.77 (4.15) 2 New York Yankees traded LHP Chasen Shreve and RHP Giovanny Gallegos to St. Louis Cardinals for 1B Luke Voit and Future Considerations. St. Louis Tuivailala r-StL 2.55 (3.69) -3 St. Louis Cardinals traded RHP Sam Tuivailala to Seattle Mariners for RHP Seth Elledge. St. Louis Pham lf1-.931 (.730) -5 St. Louis Cardinals traded CF Tommy Pham and Future Considerations to Tampa Bay Rays for RF Justin Williams, LHP Genesis Cabrera and RHP Roel Ramirez. Tampa Bay Pham lf1-StL .931 (.730) 5 St. Louis Cardinals traded CF Tommy Pham and Future Considerations to Tampa Bay Rays for RF Justin Williams, LHP Genesis Cabrera and RHP Roel Ramirez. Tampa Bay Glasnow s1-Pit 7.69 (4.34) 2 Tampa Bay Rays traded RHP Chris Archer to Pittsburgh Pirates for RHP Tyler Glasnow, CF Austin Meadowsand Player To Be Named Later. Tampa Bay Perez c2-NEW 0 Tampa Bay Rays traded RHP Matt Andriese to Arizona Diamondbacks for C Michael Perez and RHP Brian Shaffer. Tampa Bay Beeks r9-PROJ 6.23 0 Tampa Bay Rays traded RHP Nathan Eovaldi to Boston Red Sox for LHP Jalen Beeks. Tampa Bay Andriese R7-TB 4.50 (4.38) -1 Tampa Bay Rays traded RHP Matt Andriese to Arizona Diamondbacks for C Michael Perez and RHP Brian Shaffer. Tampa Bay Venters R6-PROJ 3.56 -2 Tampa Bay Rays traded LHP Jonny Venters to Atlanta Braves for Future Considerations. Tampa Bay Archer s1-TB 4.07 (4.31) -3 Tampa Bay Rays traded RHP Chris Archer to Pittsburgh Pirates for RHP Tyler Glasnow, CF Austin Meadowsand Player To Be Named Later. Tampa Bay Eovaldi s3-PROJ 3.86 -3 Tampa Bay Rays traded RHP Nathan Eovaldi to Boston Red Sox for LHP Jalen Beeks. 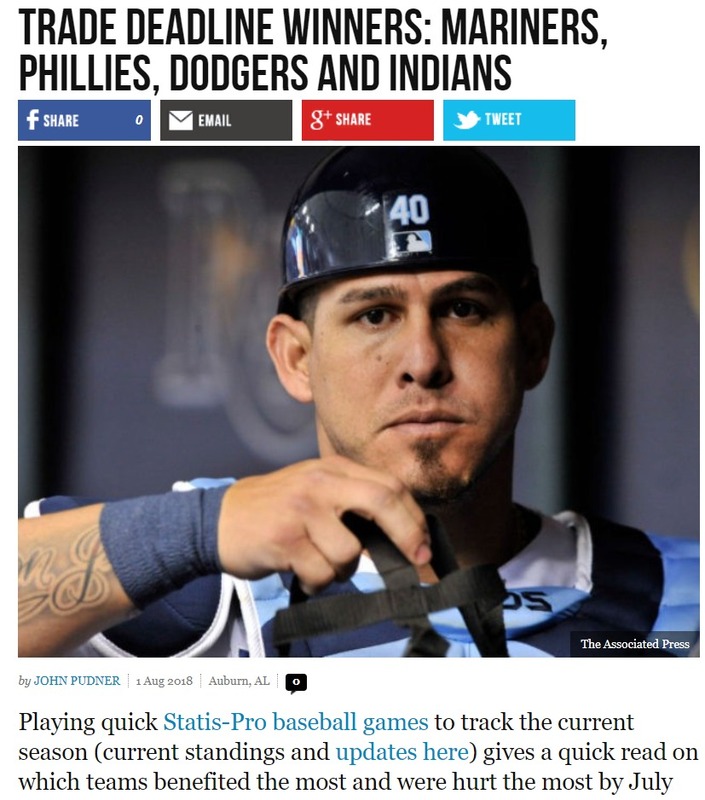 Tampa Bay W Ramos cDL-TB .737 (.834) -4 Tampa Bay Rays traded C Wilson Ramos to Philadelphia Phillies for Player To Be Named Later. Texas Butler r7-ChC 3.95 (3.79) 2 Texas Rangers traded LHP Cole Hamels and cash to Chicago Cubs for Eddie Butler, RHP Rollie Lacy and Player To Be Named Later. Texas Chavez r8-LAA 5.35 (3.03) -1 Texas Rangers traded RHP Jesse Chavez to Chicago Cubs for LHP Tyler Thomas. Texas Hamel s3-Tex 4.20 (4.72) -2 Texas Rangers traded LHP Cole Hamels and cash to Chicago Cubs for Eddie Butler, RHP Rollie Lacy and Player To Be Named Later. Texas Diekman R6-PROJ 3.77 -2 Texas Rangers traded LHP Jake Diekman to Arizona Diamondbacks for RHP Wei-Chieh Huang and Player To Be Named Later. Texas Kela r2-Tex 2.79 (3.44) -3 Texas Rangers traded RHP Keone Kela to Pittsburgh Pirates for Taylor Hearn and Player To Be Named Later. Toronto Giles r?-Hou 2.30 (4.99) 5 Toronto Blue Jays traded RHP Roberto Osuna to Houston Astros for RHP David Paulino, RHP Hector Perezand RHP Ken Giles. Toronto Drury 3b2-Ariz .764 (.527) 3 Toronto Blue Jays traded J.A. Happ to New York Yankees for LF Billy McKinney and 3B Brandon Drury. Toronto Loup r8-Tor 3.75 (4.54) -2 Toronto Blue Jays traded LHP Aaron Loup to Philadelphia Phillies for RHP Jacob Waguespack. Toronto Oh r5-StL 4.10 (2.52) -2 Toronto Blue Jays traded RHP Seunghwan Oh to Colorado Rockies for 1B Chad Spanberger and 2B Forrest Wall. Toronto Happ s5-Tor 3.53 (4.05) -3 Toronto Blue Jays traded J.A. Happ to New York Yankees for LF Billy McKinney and 3B Brandon Drury. Toronto Osuna rSus-Tor 3.38 (2.93) -4 Toronto Blue Jays traded RHP Roberto Osuna to Houston Astros for RHP David Paulino, RHP Hector Perezand RHP Ken Giles. Washington Kintzler r4-Combo 3.03 (3.59) -3 Washington Nationals traded RHP Brandon Kintzler to Chicago Cubs for RHP Jhon Romero. Washington Goodwin dl-Wash .811 (.774) -4 Washington Nationals traded LF Brian Goodwin to Kansas City Royals for RHP Jacob Condra-Bogan.